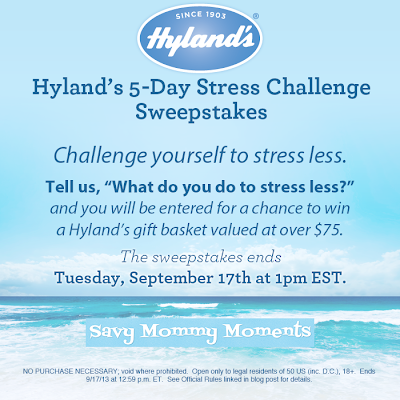 Hyland's 5 Day Stress Challenge Gift Basket #Giveaway! Stress! It's something that not a single person is immune to. At some point in life (often many points) we encounter stress. Stress can affect one's mental and physical states if not dealt with properly and lead to a total demise in one's quality of life. Personally, I can admit I have had times in my life where the stress has pushed me to the limits and caused panic attacks. These attacks prompted several ER visits which resulted in no serious diagnosis, thankfully. But, these were a wake up call that I needed to deal with my stress in a productive way. I have learned that instead of pushing my stress to the back of my mind and letting it all pile up, I need to deal with it head on. What this means is de-stressing at the end of the day. 1) Chocolate: Almost every night I eat a small snack of pure chocolate chips. These are usually paired with with a glass of milk, which aides in my stress relief but also helps avoid nighttime pregnancy indigestion. 2) Hot Bath: This isn't something I do every night, but definitely try to do one a week or more. Now that I am just 7 weeks shy of my due date, these have been happening more frequently to not only relieve my daily emotional stress, but also the physical stress. In fact, when shopping for our current home, getting a nice sized Jacuzzi bathtub in the Master Suite was a must! It was one of the first things that I looked at when determining whether or not to buy the home. And I can say, we definitely picked the right one! I usually prefer using some type of bath soap that has lavender in it as that helps calm my boy and relax the nerves. 3) Book/Magazine: While watching my favorite T.V. shows is good, reading a book or magazine I love is even better! Some of my favorite authors include Jodi Picoult and Nicholas Sparks, while some of my favorite magazines include People, Rachel Ray, and anything that has short/fun to read articles. 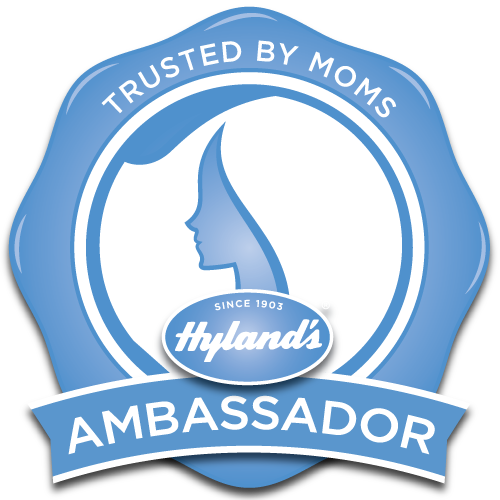 In honor of Hyland's very first 5-Day Stress Challenge, Hyland's is offering you the chance to win a fantastic gift basket full of Hyland's products to help you de-stress. Hyland’s 5-Day Stress Challenge is a free, content-driven promotion aimed at sharing information that will help participants find their way to Zen, naturally. More information on the Challenge will be provided when I announce the winner of the below giveaway on my blog on Tuesday 9/17. For now, read below about how you can enter this exclusive giveaway to help you de-stress! Easy Entry! Enter by commenting on this post with your answer! Also, please provide your e-mail address on your post so I can easily contact you if you are winner. If you aren't comfortable doing so, then make sure you check back to see if you are the winner announced on the blog on 9/17/13. Click Here to read the full rules and regulations. Wednesday, September 18th: Registration begins for The Challenge on the Hyland's FB page. The first 1,000 people to sign up will also receive a free, full size Hyland’s Nerve Tonic to be sent to them prior to the launch of The Challenge. Monday, September 30th - Friday, October 4th: Each day on the Hyland’s FB page, we will feature daily challenges and information relating to a specific topic that promotes natural solutions for managing and reducing stress. At the end of each day, participants will answer a question for a chance to win a Hyland’s Stress Less Duo, which includes Hyland’s Nerve Tonic© and Hyland’s Calms Forté© AND a blue “Keep Calm and Take Nerve Tonic” T-shirt. Five winners will be chosen at random each day. 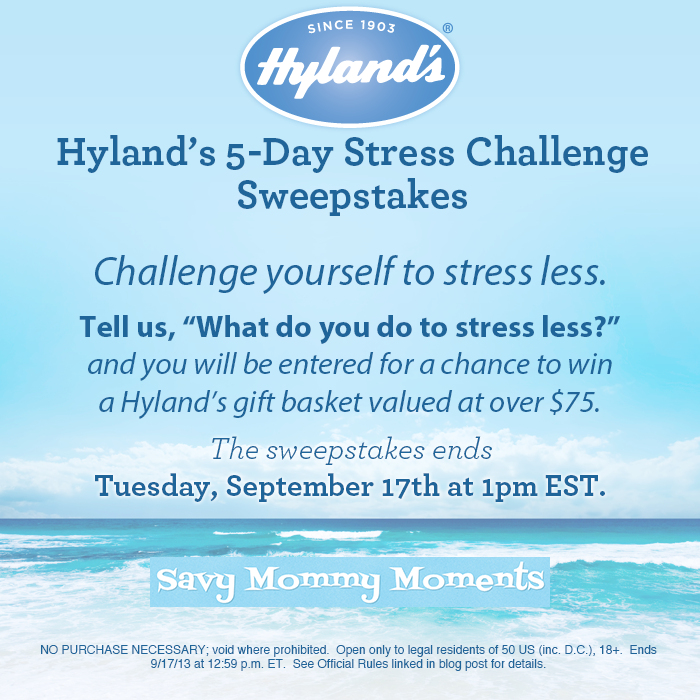 On the final day of The Challenge, in addition to the Stress Less Duo, there will be the chance to win the GRAND PRIZE basket chock-full of anti-stress products from Hyland’s and other amazing partner brands AND a $100 Spafinders gift card by answering a brief, five question survey to help us better understand their experience with The Challenge. I "stress less" by knitting! It calms me and gives me something to do with my hands, concentrating my pent up energy into my hands. I "stress-less" by grabbing a cup of tea and a good book. I "stress-less" by taking a hot bath while my kids are napping. My husband works very late hours so I usually don't get a second to myself. I "stress-less" by making sure I take at least an hour a night to just sit and relax with a nice glass of wine. I "stress less" with hot bubble baths with lavender or reading a good book. I stress less by blasting some good music! i stress less by just taking a deep breath and just letting it go! I try to think of the positive things in my life not the bad stuff. I try to read at least one book every other week! ssromans828@yahoo.com :) thank you for the great giveaway! I try to take a few minutes to just relax with a cup of coffee or something else that I enjoy each day! Oops, I forgot the 'I stress-less'. Also, email is brittchelette@gmail.com :) thanks! To stress less I exercise It used to be running and high intensity or hot yoga but now that I am pregnant it is walking and low intensity workouts or prenatal yoga. I like to sleep to help with stress. Or try to find a quiet moment to read a page or two in a book before the next interruption! Love to read beflre bed to destress! Exercise also helps! CLOSED FOR ENTRIES AT 12PM CST 9/17. VTECH Cody the Smart Cub #Giveaway! "What's It Like? Wednesday" Living on a Farm?